Finally! I've been trying to get canned since I got this gig! Don't worry, you won't be kept awake all night by the sounds of machinery packaging fruit. 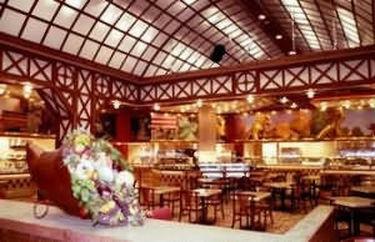 The cannery theme doesn't extend very far into the hotel section. In fact, no theme really extends, unless you consider moderate hotel a theme. You get a clean, average room with either two doubles or one queen, a sitting chair, flat-panel TV and amenities like a hairdryer and ironing board. The bathroom is not luxurious (meaning tub/shower combo and no fancy jacuzzi jets). There is some pretty good low limit gamingthough, so that's a plus. Check-in is okay because of the small size of Las Vegas Cannery Casino Hotel, but still slower than it should be. Overall services are limited, and this is not a good hotel for business travelers. But what's this? Coin-operated washers on the premises? Now that's fancy! Shampoo/conditioner and lotion. They want you clean, soft and nothing more. Locals locals and more locals, mostly blue collar. About what you'd expect from a 200-room hotel. Decent, better than a Motel 6 and larger with an abstract shape, but nothing like the decadence of the Strip properties. There are a few palm trees on its edges and a little hot tub, at least. Eh, unless you absolutely have to be out in North Las Vegas, there are better ways to spend your money. 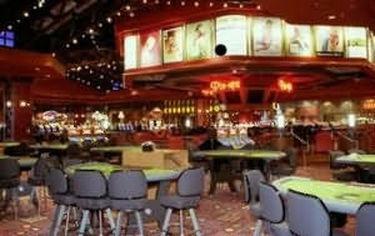 Play blackjack, craps, roulette, Pai Gow or 3-5-7 Card Poker. Roulette is double-zero, blackjack has mediocre to poor rules. It's standard stuff spread over 21 total tables. $5 for everything across the board, except during really slow times. Craps has fabulous 100x odds. Roulette is usually with $1 chips and a $5 minimum. The Cannery Casino Las Vegas has lots and lots of video slots at the nickel level. Plenty of the new games are in the Cannery's around-1300 slot inventory. Machines go up to $5. 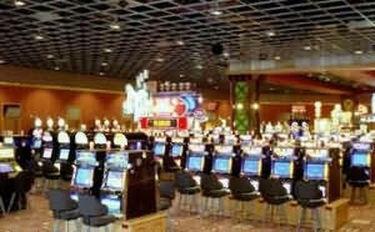 The video poker selection is decent, and there are a few full-pay machines, so look around carefully. Decent cocktail service will get the long-term player a nice little buzz to soothe his bruised wallet. The slot club at Cannery Casino Hotel Las Vegas pays back decent. Tables may score you a coffee shop comp for $15 play if you are polite (not us) and let the pit boss know you're playing when you sit down. 13 TVs with two big screens. The room is large and there aren't enough TVs to go around. About 130. That's enough for 130 regular folks or 60 morbidly obese ones. The seats are almost all below average, but 90 for race have individual TVs. 11, with electronic scoreboards. The Cannery Casino Hotel Las Vegas takes bets on horse racing, and they also take wagers on Arena Football. Does someone actually pay attention to that? Yes, if you can snag a cocktail waitress or somehow finagle one from the bar. Good luck, though, since this is off the beaten path. Java Coast serves pastries, coffee and a few other items for the hungry and wicked. Or just hungry. The Cannery Casino Hotel Las Vegas is probably not the best place to see the big games. It's not comfy and it's too big for its amenities. 11 tables, and a ton of space for them. Half or fewer are usually in use, unless it's tourney time. The chairs are below average, but what's more comfortable is the waiting area with the leather sofa. That's why we'd come all the way out here. It's open to the hallway and it is its own space. Being down a hall, the poker room is not exactly easy to find. $2-$4 and $3-$6 Hold 'em in limit and $1-$2 no-limit flavors. The dealers and brush will be happy to give you a few pointers when it's slow, but we don't know of a class at the Cannery Casino Las Vegas. Not crowded. The room is not geared toward serious players. Don't expect to wait. It certainly isn't worth a wait longer than that. It's a dollar an hour, plus a bunch of potential free rolls and jackpots that are geared toward the locals. If you play a lot of poker in Vegas, then the local stuff is a good deal. 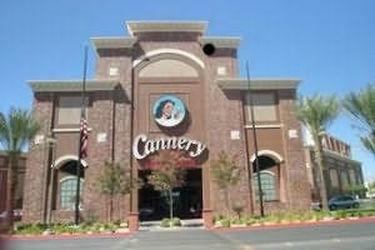 If you're only in for a couple days at the Las Vegas Cannery Casino and Hotel, they aren't worth much. Locals, locals and more locals. This is where the folks from the neighborhood come to shoot the breeze and play a little. Not good players, but they can be pretty tight. This is vastly better than the old poker room, but still not worth going way out of your way for, unless you got a hankering to play the locals. One nice thing is the $3 max rake (plus a dollar for the jackpots). Choose between a king or two queens in the newly remodeled rooms at Cannery Casino Hotel Las Vegas. Rooms come with a 37-inch LCD TV, in-room WiFi (for a surcharge), hairdryer and iron/ironing board. Pay movies and an on-site coin laundromat are also available.